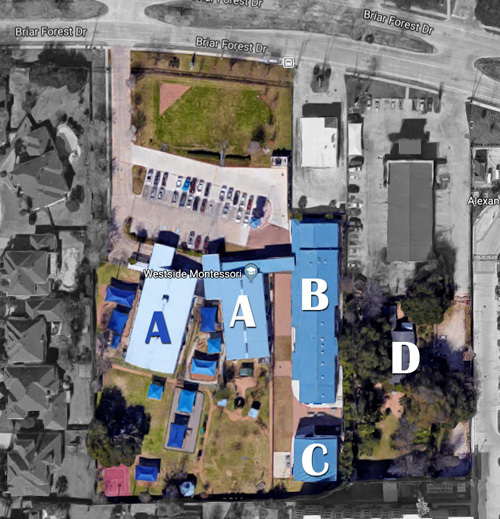 Westside Montessori School is conveniently located in the Energy Corridor of west Houston, near Eldridge Parkway on Briar Forest Drive. Our 4-acre campus boasts beautifully landscaped gardens featuring ponds, a gazebo, ample seating, and several walkways. A shaded sports court, large soccer field, sandboxes, and playgrounds for all levels have been incorporated throughout the grounds. Houston is the fourth most populous city in the nation and is the largest city in the southern U.S. and Texas. With an educated workforce comprised of more than 94,000 employees, the Energy Corridor is the second largest employment center in the region and one of Houston’s fast-growing areas. Families at Westside Montessori School enjoy outdoor activities easily with over 50 miles and 26,000 abundant acres of recreational parks and trails nearby. The Addicks and Barker Reservoirs include George Bush Park, Bear Creek Park, and Cullen Park. The heart of The Energy Corridor is Terry Hershey Park, which winds right through the Corridor connecting neighborhoods and businesses along eleven miles of trails. The Ray Miller Park is another favorite for students to enjoy due to its close proximity to the school. The west side of Houston offers first-class shopping, dining, and entertainment, and in the heart of the city residents and visitors can attend theater, ballet, symphony and opera performances. The many museums, exceptional zoo, performing arts centers, and vast opportunities for cultural experiences are the benefits of living in a city of over 2 million residents. There are endless culinary, cultural, and artistic offerings to be enjoyed in this metropolitan area. Houston has outstanding professional sports teams representing football, baseball, basketball, soccer, and AHL hockey. Houston is home to the Houston Livestock Show and Rodeo. The world’s largest livestock show and rodeo that attracts more than 2.2 million visitors each year. Houston has among the youngest populations in the nation which might be attributed to the more than 40 colleges, universities and institutions found here. Houston is home to the Texas Medical Center, the largest medical center in the world, with a local economic impact of $10 billion. More than 52,000 people work within its facilities, which encompass 21 million square feet. Over 4.5 million patients visit them each year. These facilities are internationally recognized for their industry-leading research in the field of medicine and outstanding treatment facilities. The Port of Houston ranks first in the United States in international waterborne tonnage handled and second in total cargo tonnage handled. It is the tenth largest port in the world. Houston is one of the world’s largest manufacturing centers for petrochemicals, and the $15 billion petrochemical complex at the Houston Ship Channel is the largest in the country. Houston has more than 400 chemical manufacturing establishments with more than 35,000 employees. Houston has two of four largest U.S. refineries. Houston is home to the Johnson Space Center, NASA’s largest research and development facility, employing nearly 3,000 federal civil service workers and more than 14,000 contract personnel. 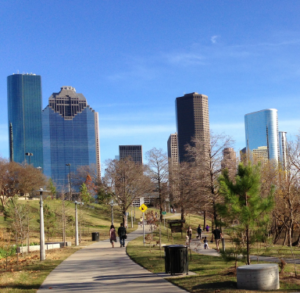 There is something for everyone in Houston, and on the west side, families can enjoy a peaceful and active lifestyle. The community that supports Westside Montessori School is unlike any other, and a wonderful place to call home.